When there is any sickness or accident etc. in the house, the tantrik is called to pacify the anger of goddess Kali. 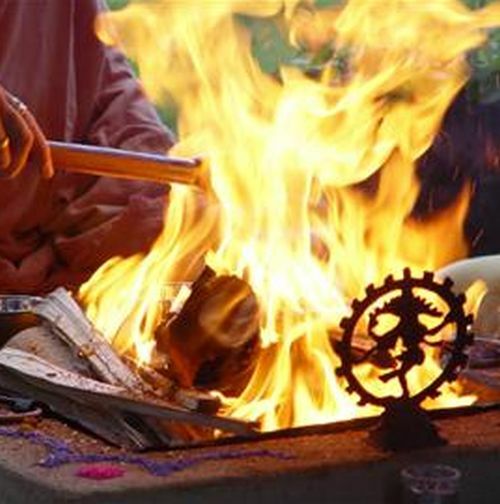 First, he conducts havan burning firewood and ghee. He then pours blood in a plate, keeps a lit lamp over it and covers the lamp with a vessel. He goes around the lota praying to the goddess to drink the blood and bless the family. When he completes three rounds the blood in the plate disappears. The household is satisfied. After collecting his fees, he puts the plate and the vessel in his bag and walks away. Props: One plate, potassium permanganate, water, a lamp with wick and oil, one vessel. Method: Pour water in the plate over a little bit of potassium permanganate, which would look like blood. Keep a lamp in the centre of the plate and light it. Cover the lamp with the vessel. Thus the vessel is sealed with the water in the plate. When the oxygen in the vessel bums up, the lamp gets extinguished. The carbon dioxide in the vessel mixes with water creates a vacuum and the red water is sucked into the vessel. Effect: A person dies when a doll's head is twisted. The sorcerer twists the head of a doll naming a person and he dies instantly. Though Premand has written how this feat can be accomplished, we don't want to provide the details here.